Phoenix has a long list of exceptional restaurants, though none are serving up anything quite like what you will find at Binkley's. 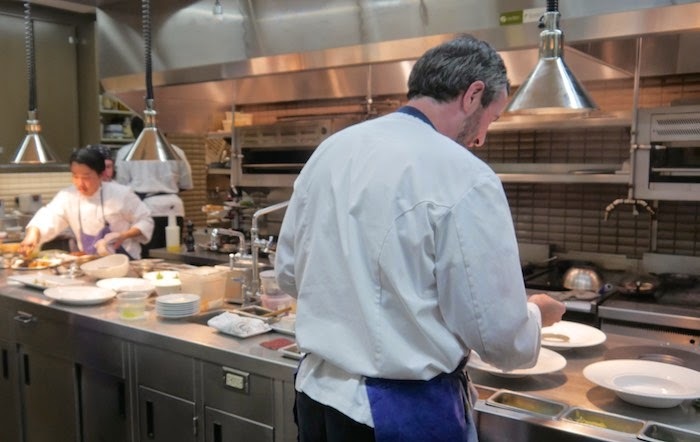 Chef Kevin Binkley, known around town for being a food pioneer, uses fresh local produce to create imaginative dishes at his namesake restaurant. 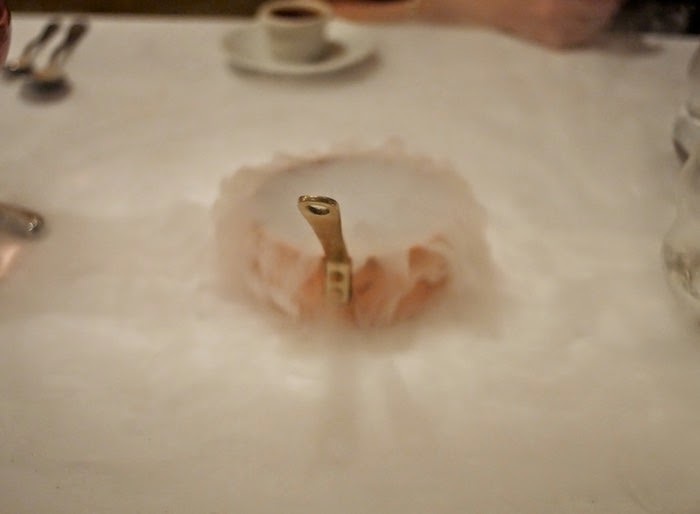 Be prepared for unique tastes and presentations; and don't be alarmed when food flash frozen with liquid nitrogen burst in your mouth, releasing irresistible flavor. While you can order anything off the daily menu as an individual item I highly suggest going with the either the 4, 5 or 6 course tasting menu. 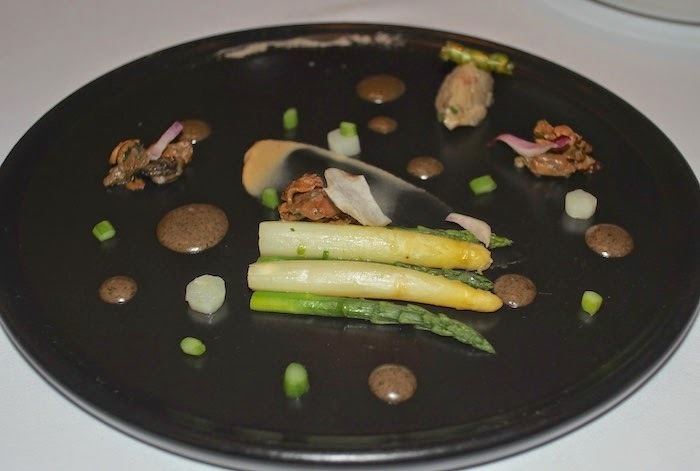 Items served as part of the tasting menu are considerable smaller in size so that you can enjoy more variety. No matter which menu option you choose be prepared for additional items to arrive at your table unannounced. 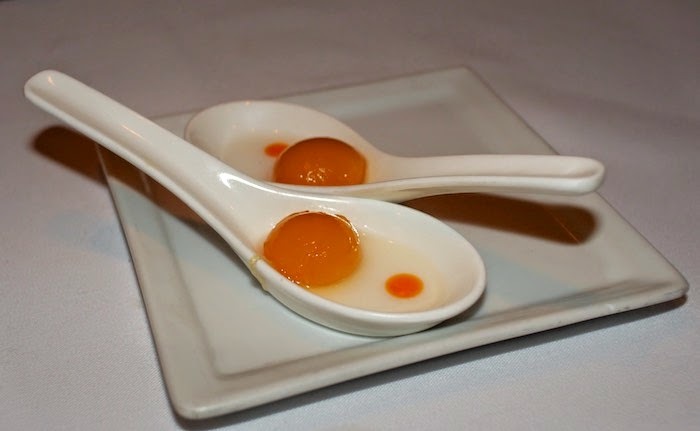 Chef Binkley is known for his amuse bouche and will often send out several during the course of the evening. You may get things like the world's smallest sloppy Joe complete with a slice of cornichon, garufrette potato chip & caperberry. 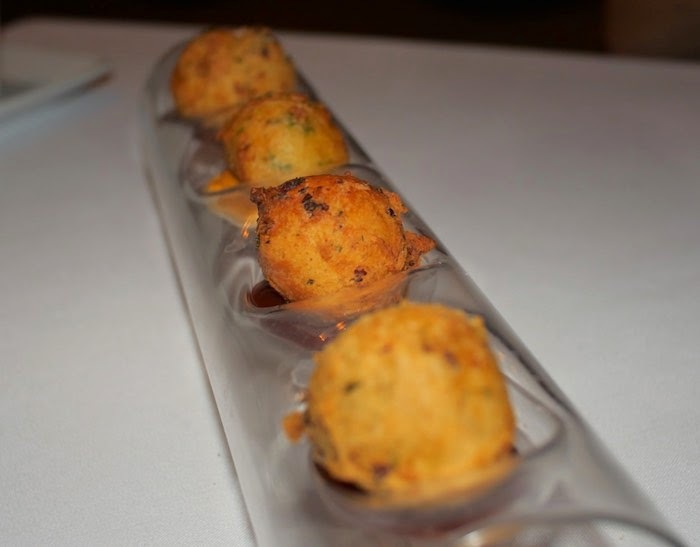 Or perhaps a platter of chorizo & shrimp fritters with tonka bean BBQ sauce & remoulade. You never know what is going to show up, making the entire dining experience very exciting. 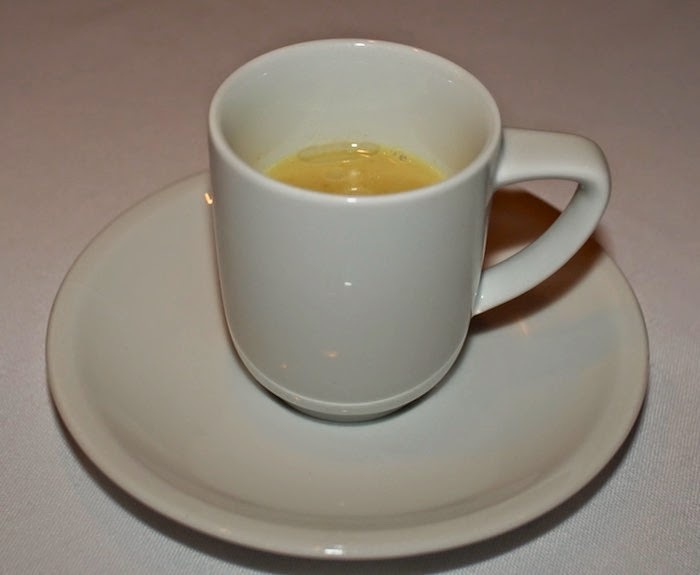 One of my favorite amuses, on the evening we dined, was the coconut curry pear soup with a drizzle of raisin oil. It was delicate and delicious and the idea of raisin oil fascinated me. The ham & carbonated pineapple was also yummy and rich with flavor. One bite is all you need of this classic flavor combination prepared with a twist. And the most unique presentation of Fruit de Mer I've ever seen. 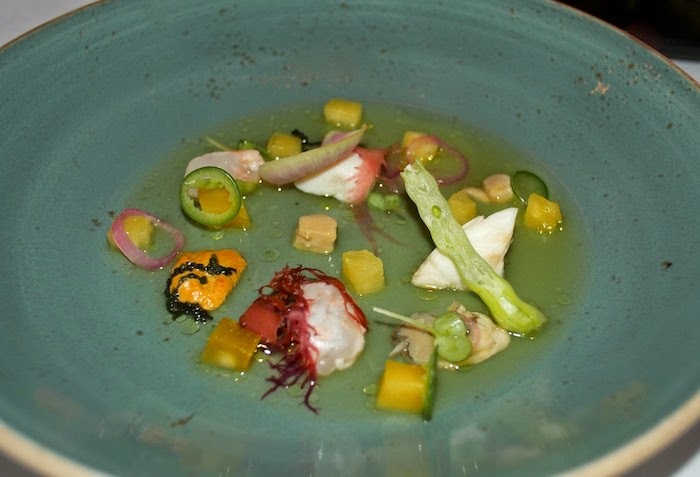 Tiny pieces of prawn, crab, uni, & oyster plated with seaweed, red onion, radish, mango & pineapple. Both appetizers were well balanced and an absolutely refreshing way to kick-off our meal. 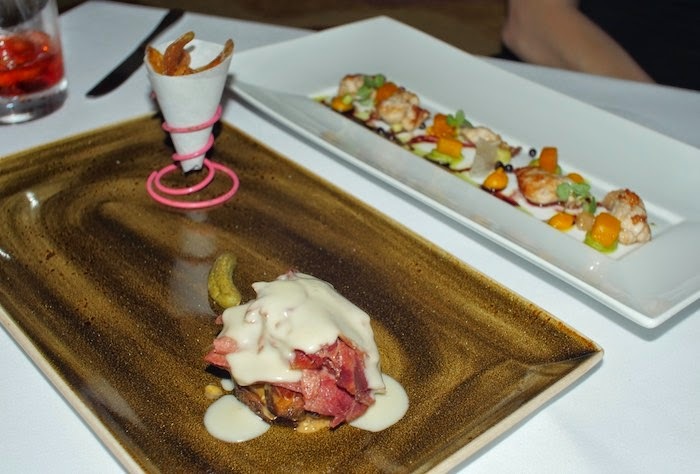 The cold appetizers were followed by two hot ones: the beef tongue Reuben & the sweetbreads. Like a classic Reuben the thinly sliced beef tongue was topped with choucroute, (a French sauerkraut) and Thousand Island dressing. The sweetbreads were accompanied by tiny bites of kabocha squash, an avocado puree, some elderberries and a curry-port vinaigrette drizzle. 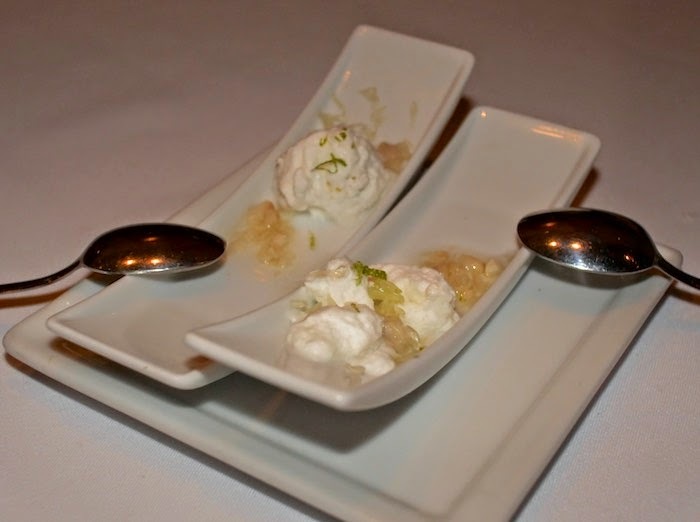 Before moving on to our main course we were given a small plate of coconut semi freddo with lime cells, macadamia nuts & lime oil to prepare our palate for what came next. 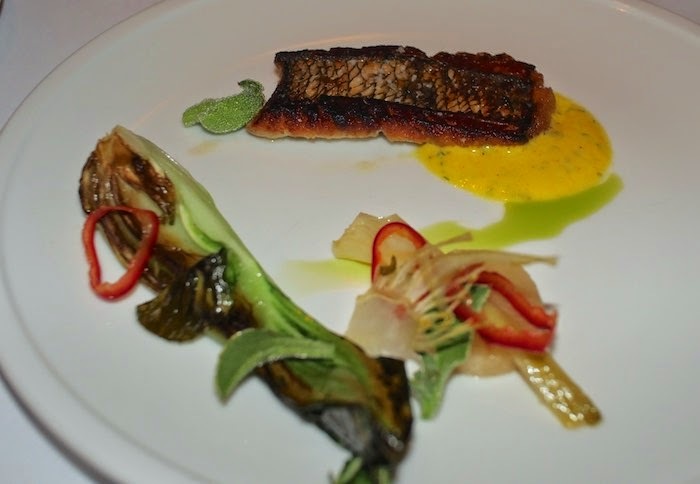 And the black cod, which was served with fresno chili, miso braised daikon, glacier lettuce and a spicy yogurt. Both entrees were a treat to the taste buds. 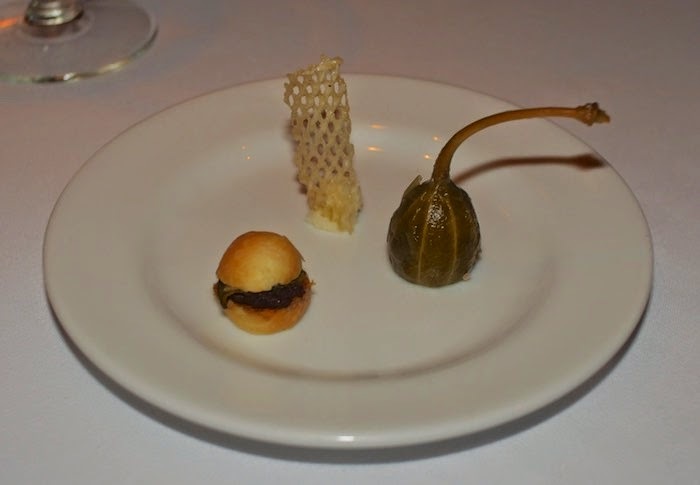 Just when we thought dinner was over Chef Binkley brought us an item from the cheese course menu. 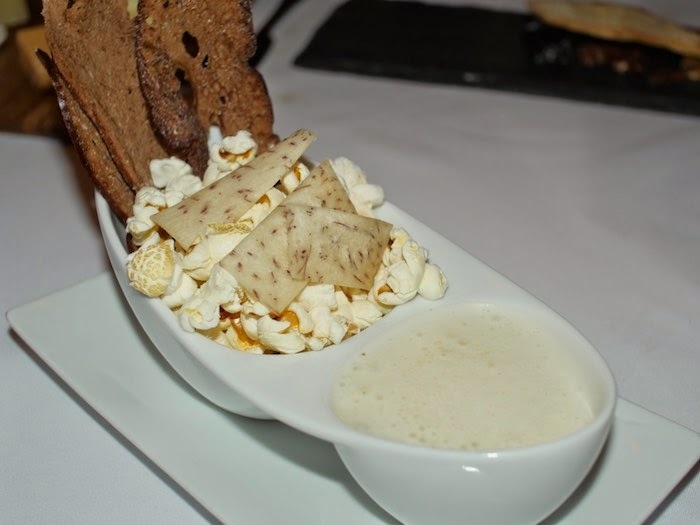 The "dip" was a whimsical mix of popcorn, house made crackers and taro root for dipping into a bowl of warm truffle mousse. The entire evening was full of surprises including the small pot of vanilla cinnamon water, bubbling from the added liquid nitrogen, that was delivered to our table. The mild scent was meant to compliment the candied apple creme brulee we also received. 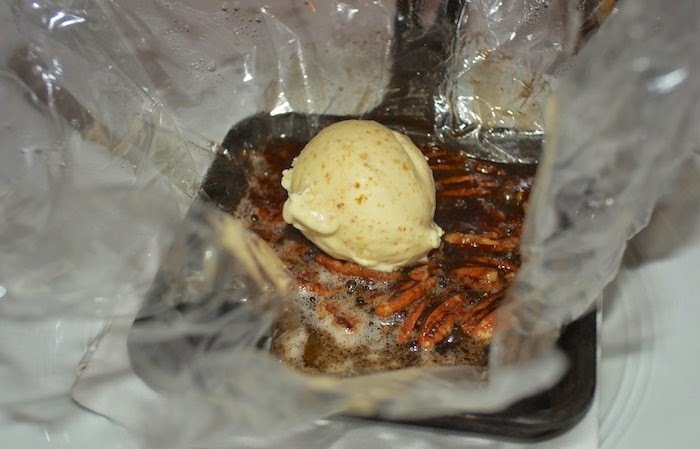 But the show-stopper was the warm butterscotch & pecan dessert served with browned butter ice cream slowly melting on top. 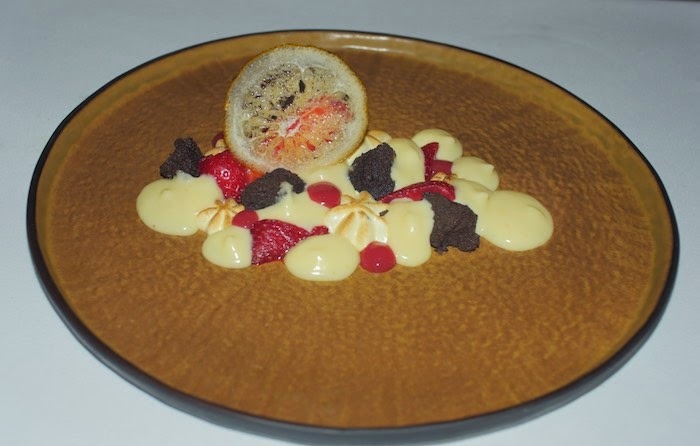 The dessert features a nontraditional take on the en papillote cooking method, but instead of parchment Chef Binkley uses Fata Paper, which is a cellulose paper that can cook to about 500 degrees and is also see-through for presentation purposes. Needless to say dinner at Binkley's is way more than just another meal it is truly a food "experience" that everyone should have at least once in their life. I've never been to Phoenix...but it sure looks like they have some good food! So cool! Just down the street, and I have never been (quite different from Cafe Bink, eh?). This will be my "nudge" to make it there! Wow, another amazing meal! I love the sound of those chorizo and shrimp fritters. What a fun and enticing experience - I want to try it all! What a delicious looking restaurant! 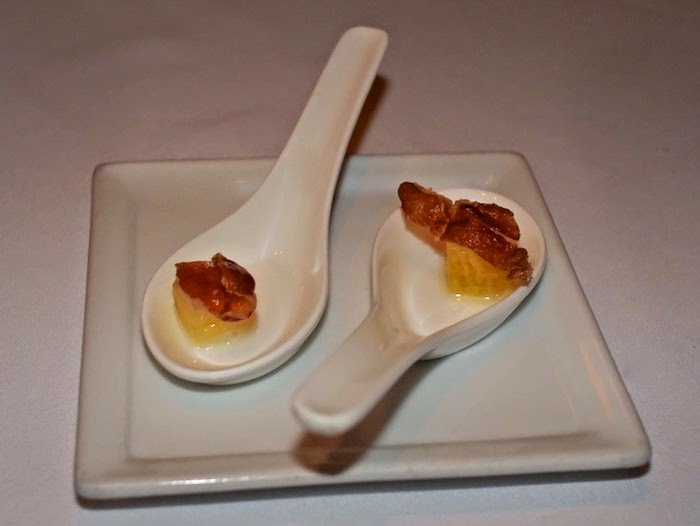 I bet that butterscotch & pecan dessert was amazing! I've only been to Phoenix once but this looks like a great restaurant! These all look so good! 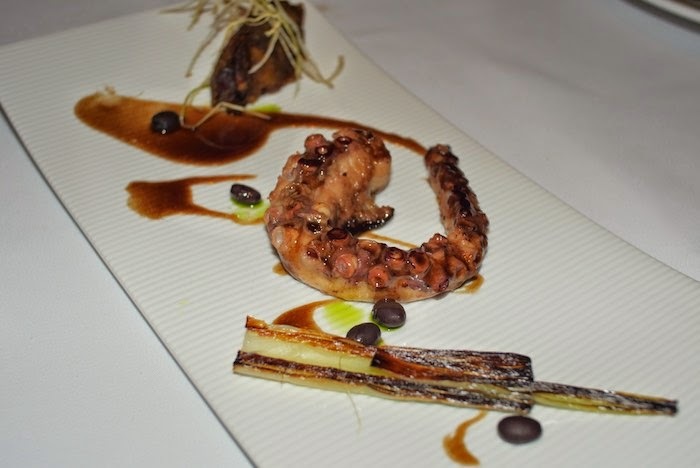 It' hard to say which look best but well cooked octopus is a real treat!